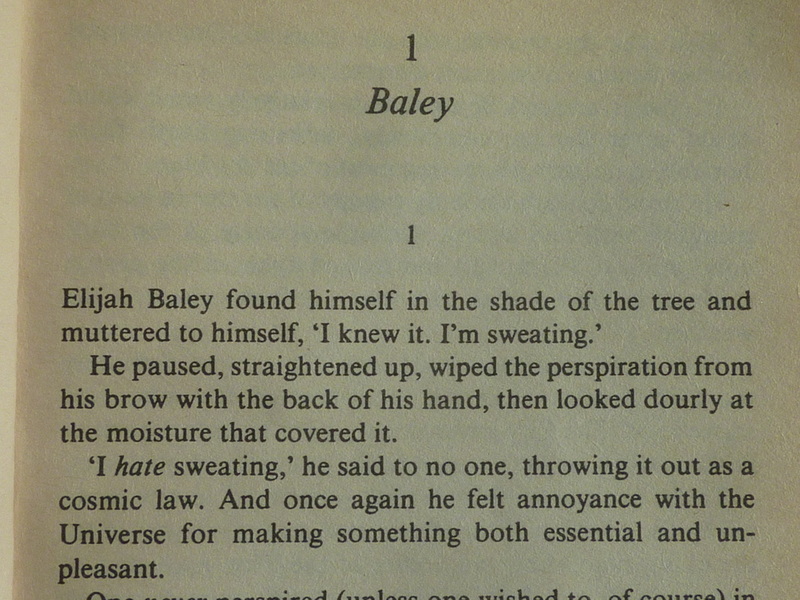 This is probably my favourite novel of all time; and in my humble opinion, an absolute masterpiece. It is certainly my favourite Isaac Asimov novel. I like to think that nearly everyone has a book which they adore. A book which, when they open it and start reading, just feels right. Feels like coming home. This is that book for me. It's as close to perfection as I think a book can be. I just love reading every page! I have read this book countless times. It encapsulates everything I love about the way Isaac Asimov writes. That is, there is very little extraneous material; everything is coherent. Everything seems to make sense. Everything is beautifully clear. The characters are beautifully formed. Conversations are engaging, points of view are evenly forged. Maybe I like this kind of writing because I'm a bit dim and cannot fathom complexity. But I think it's more to do with coherency. I just enjoy things more when they make sense and when I can make sense of what is going on. This book also manages (for me) to be incredibly evocative. The world he imagines comes alive in my imagination. With the exception of 'Rendezvous with Rama', not many other books seem to ignite an image of events, architecture and landscape inside my mind, as well as this one. For those of you who are Asimov fans, this may sound a little bit surprising; as Isaac was certainly not renowned for his writings being evocative or descriptive. In fact, many critics decry his work for exactly the opposite reasons. But then that is the beauty of books. It does not take much to fire a young imagination, and for me, the characters and dialogue alone, form a sort of framework in my mind's eye and then I paint in the rest. Surely that is what any good book should do? I am also aware that the majority of critics place Asimov's earlier novels ('The Caves of Steel', 'The Naked Sun' etc) higher up the scale in terms of quality. But it is my belief, (especially in the science fiction genre) that the novels you read in your formative years, (when you are young) have an increased tendency to stick in your mind and become 'untouchable'. I had this book with me so much when I was a lad and have read it in various locations around the world, and hence it holds a special place in my heart! Outside of the reasons above, another thing I love about this book is that it introduces some of my favourite characters from the world of fiction. Namely Vasilia Fastolfe and of course, Giskard Reventlov, the robot who becomes so crucial within Asimov's fictional universe. Vasilia is the daughter of Dr Han Fastolfe, the creator of Giskard. She is a feisty, intelligent woman whose conflict and interaction with Elijah is just superb. As for Giskard, well! What a creation he is. Most people who love these books, tend to love the robot Daneel the most. I think Daneel is an awesome creation, and indeed it is Daneel who Asimov mostly uses to intertwine his 'Robot' and 'Foundation' novels into a single unified universe. - But for me, especially in this book, it is the quiet reassurance and omniscience of Giskard's character that I love so much. He's the yin to Daneel's yang. Their relationship is explored much further in the sequel to this book, 'Robots and Empire', which is also terrific, although I think not as good as this masterwork. 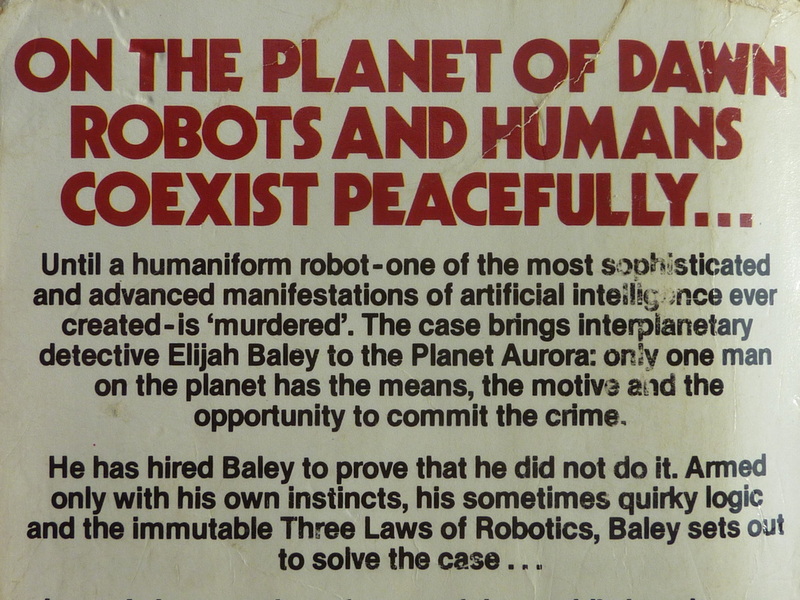 The Robots of Dawn continues the story of Elijah Baley, an Earth-man detective who this time is called to the planet 'Aurora' to unravel a potential case of robot 'murder'. He is accompanied on this task by the humaniform robot, Daneel Olivaw, whom he originally teamed up with in Isaac Asimov's first robot novel, 'The Caves of Steel'. Whereas 'The Caves of Steel' was set on Earth, and it's sequel, 'The Naked Sun' was set on 'Solaria'; this third robot novel is set on the oldest of the 'Spacer' worlds, 'Aurora'. Aurora was the first world to be settled outside of Earth and consequently has the most advanced technology, especially with regards to robots. The planetary name, 'Aurora' lends itself to the 'dawn' part of the title. (From the latin word for sunrise). Elijah must deal with the strange culture of the planet (a world in which people are surrounded by robots) and use his ability to understand people and their motives, whilst also struggling with his own fear of open spaces (agoraphobia). There is nothing 'fuzzy' in this book. Nothing where you think, 'eh, I don't understand' or 'that doesn't make sense'. This to me requires enormous skill and talent to pull off. Rather than 'hide' behind overly complex and pretentious mechanisms, everything posseses simple clarity and is laid bare. And despite this, the outcome of his works is often still very surprising. Fantastic! Back in 2001, I spotted a rare signed hardback version of the book on Ebay. Simply to find out that this item existed, thrilled me immensely! Back in 2001, Ebay was a LOT smaller than it is today and I could not believe my luck. Today, you can often find 'signed' items on the web, but more commonly, these are signed bits of paper or cards, that are attached to the book. That is not the same thing! So with my excitement swelling, I ended up spending the next week in a frantic bidding war with another potential buyer (something that ideally should be avoided!) The bidding tick-tocked back and forth and the price crept up and up. I like the fact that his signature is long and clearly legible too. It must have taken him an age to do a full book signing session. I think it's fair to say that the majority of 'modern' famous people barely have a squiggly line as their signature, as they want the fastest possible way of signing something. Not so for the good doctor. Isaac signed everything as you see here. Old school! 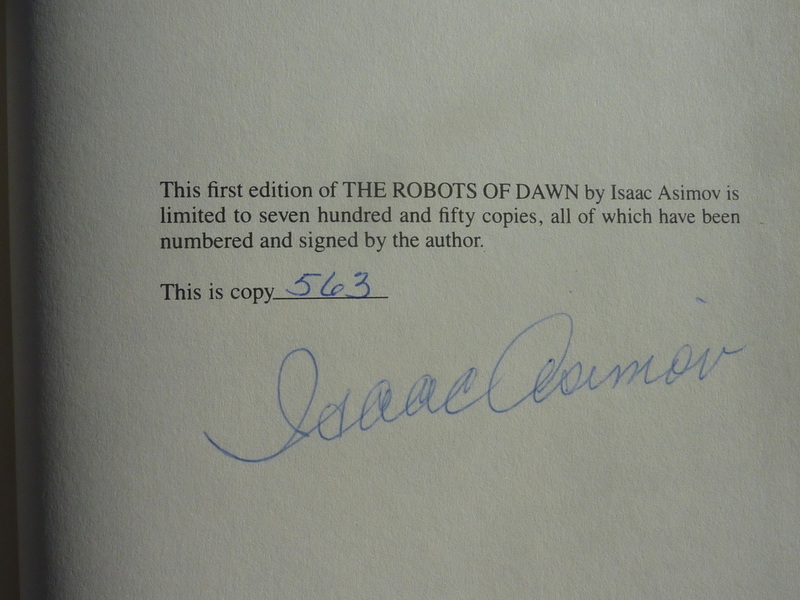 Just think, Isaac Asimov once held my book in his hands! I'm quite fascinated by artwork and concept paintings that depict the universe of Asimov's writings. I think this is partly because there doesn't seem to be that much material out there. Also, most of Asimov's works have not been made into films (certainly not good ones), so by and large there doesn't exist a well rounded depiction of what his characters/worlds look like. This is in contrast to (for example) 'The Lord of the Rings' where a great deal of superb artwork and concept drawings exist. However, I do quite like the above painting that was created for this hardback edition. 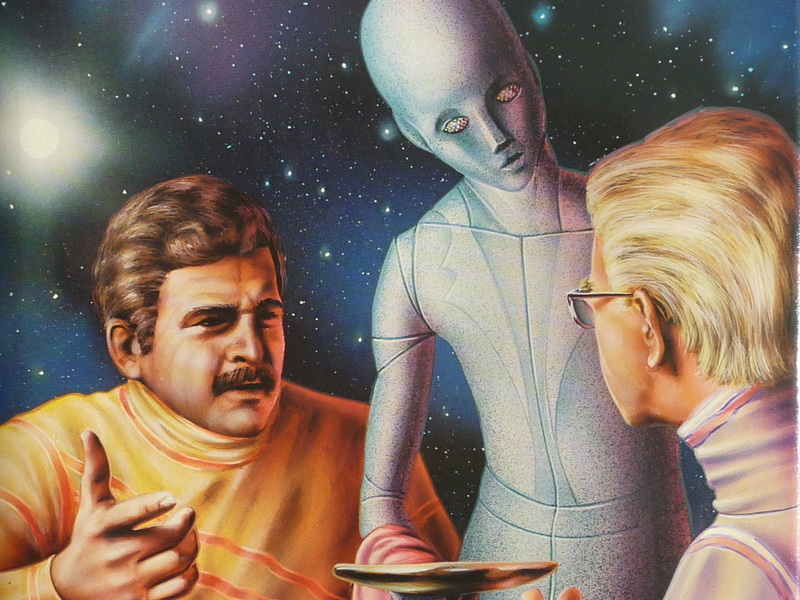 It shows Fastolfe speaking with Elijah Baley, whilst one of his robots serves them a meal. 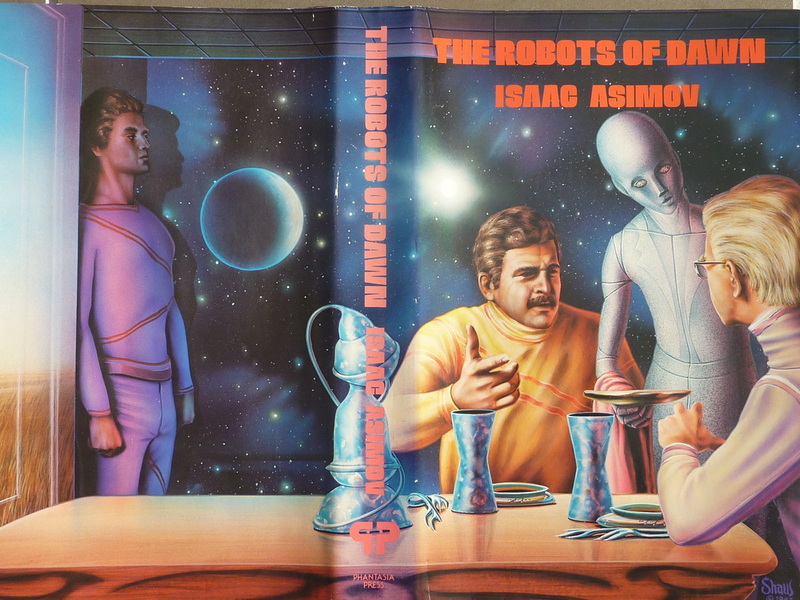 I wish Isaac had had time to write more Robot novels before he died. Because this is my favourite novel he wrote, I wanted more! (He did write one sequel to this book though). Incidentally, his death in 1992 had a surprisingly strong effect on me. 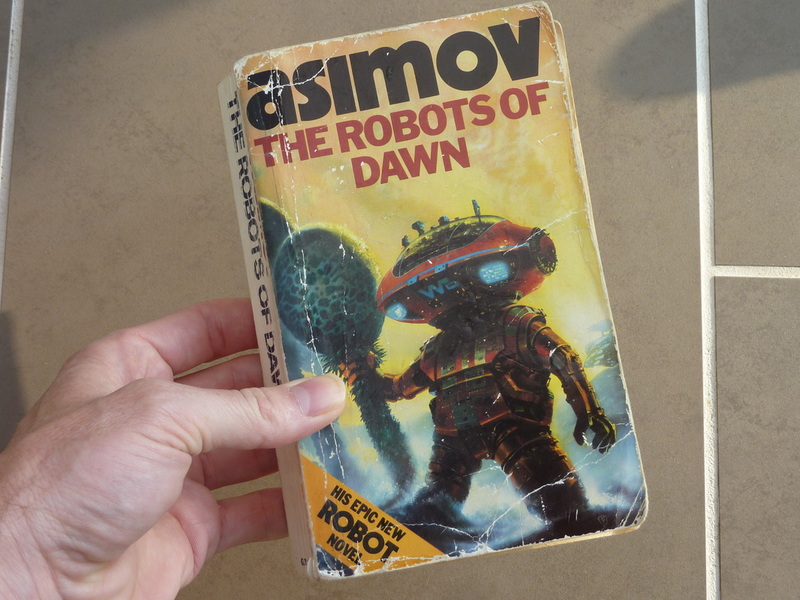 I remember standing in WH Smiths in Poole and noticed a new book by Asimov sitting on the shelf. It was called 'Prelude to Foundation'. I grabbed it excitedly, opened it up and saw that there was an 'Author's Note' at the beginning. In this section, Isaac talked about possibly writing additional novels and he mentioned possibly writing additional Robot novels too. I was so excited! "... I don't expect to live forever, but I do intend to hang on as long as possible." I can remember thinking at that moment, - please don't die yet! And yet it was the the very next week, the very next week, that I happened to see a magazine on a friend's coffee table (I think it was 'Time' magazine) and I started idly flicking through it. As the pages flicked past, I thought I spotted the name 'Isaac Asimov' and so quickly went back through to see if had indeed seen his name. I got to the page and yes, his name was there - in the Obituaries. I was totally shocked and saddened. You have to remember that at that time (seems bonkers now) - there was no internet. No way to look this stuff up. You did or didn't know. As it turns out, Isaac died of an HIV infection which he contracted from an infected blood transfusion. How unlucky is that?! This information was not revealed however for at least 10 years after his death I think. I've been trying hard to find an image of the Time Magazine in which I first saw this news, but I cannot find one online. Also, it may have been in the 'May 1992' edition that it was recorded, not the April one. If anyone finds out this information - do let me know! A year after he died, (April 6th 1993) along with my friend Rob, we went to the pub to remember the Good Doctor and chat about his work. 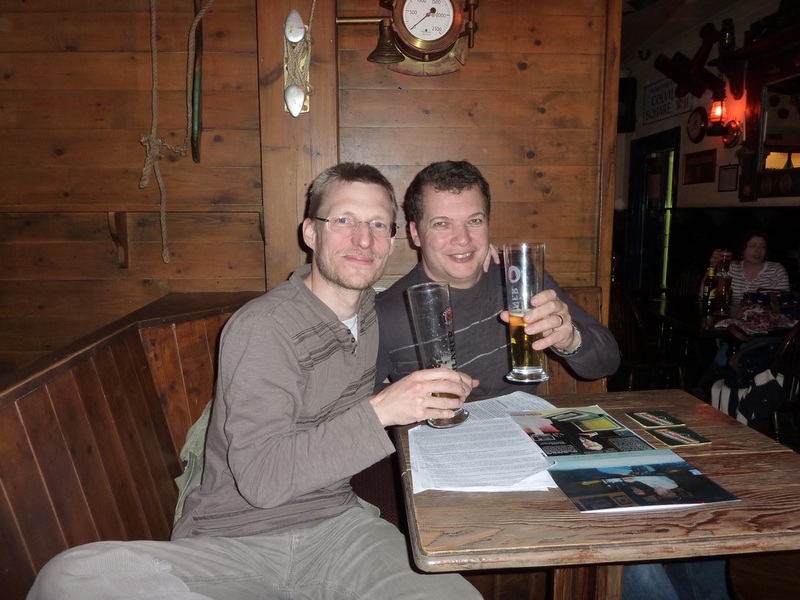 Then on the same date in 2012, we did it again to commemorate 20 years of his passing and to once again celebrate and chat about his work. Below is a photograph from each of those events.